Enjoying life on the water is one of the many advantages of Tchefuncta Club Estates. The private deep water Marina at TCE has over 60 covered slips with lifts and dry storage on the beautiful Tchefuncte River. Formed by an ox-bow of the Tchefuncte River, Lake Emfred is one of the many treasures found within Tchefuncta Club Estates. The lake was named Emfred to honor EMma and AlFRED Suter the original owners of the land that is now the Estates. The lake forms a natural harbor with a seven-foot channel into the Tchenfucte River. Because it is privately owned by TCE, the use of Lake Emfred is reserved solely for the homeowners of the Estates. Shaded by cypress and pines Lake Emfred provides many ways for Estates residents to enjoy the natural beauty of the surroundings. In the park area near the lake, parents and children gather to romp on the playground equipment. A picnic and bbq area along the shoreline offers beautiful views to be enjoyed while eating. The boat launch in the park provides access to lovely Lake Emfred, the Tchefuncte river, Lake Ponchartrain and wherever the wind and water may take you. Nature is preserved and cherished within the confines of Tchefuncta Club Estates. Around every turn you’ll discover designated green space that defines the native character of the Estates. Fully stocked fishing ponds provide anglers from beginner to expert with opportunities to test their fishing skills. Much of Tchefuncta Club Estates remains as it was over half a century ago, with towering pines and majestic oaks forming a canopy of green over a neighborhood of unparalleled beauty. Celebrations are an important part of life in Tchefuncta Club Estates. Friends and family gather as a community to celebrate each season with parades, picnics and parties. Fireworks light up the night sky over the golf course for the annual July 4th celebration. Everyone is happy to greet Santa Claus when he makes a special trip to The Estates for the Christmas Parade. 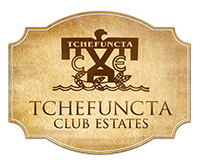 Each generation of residents adds to the neighborhood traditions making wonderful memories for the families of Tchefuncta Club Estates.